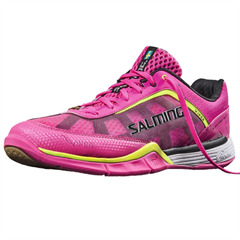 The construction has its origin in the Salming Running shoe product range, where it has been very well received with its three layer system where the unique Salming ExoSkeleton keeps the foot in the right position during lateral movements and high performance activities. Agile, fast paced with a low profile The Viper. At the core of the shoe's design, you will find Salming's unique T.G.S. 62/75 system which specifically designates the distance from heel to the ball of the foot (62% of the shoe) in order to optimize stability, comfort, and performance. Key to this design is the firmer, stabilizing section which ends at the ball of the foot at the so-called ballet line, a 75 angle. In front of the 75 line, they have equipped Salming Viper with a specially composed section which gives greater flexibility in order to further stimulate the foot's natural movements. The midsole features a special High Abrasion Injection EVA - RunLiteTM - designed to create a nice feel for the court. It is light and responds to the surface from the very first step. 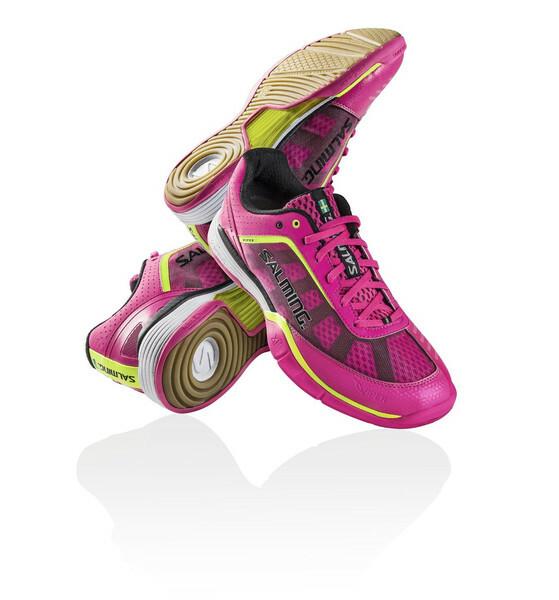 In addition, the Viper features both the 11 angle concept on the outer edge of the shoe which helps avoid the risk of ankle injury, and Salming's innovative RollBarTM-technology on the inner edge, for quicker and better lateral push-off. In order to help you control all of this cornering performance, Salming's XR110 outer sole has an extrasticky developed compound!